How does Fanteraction™ work for the audience? How does Fanteraction™ work for the band? If you could make a few cents everytime a fan downloads or streams one of your songs, would you? That’s the idea behind TrueAnthem (crunchbase profile), a company that’s developing an advertisement platform disguised as a widget: bands allow their fans to stream and download their music for free, and brands place 3-5 second ads before each song. 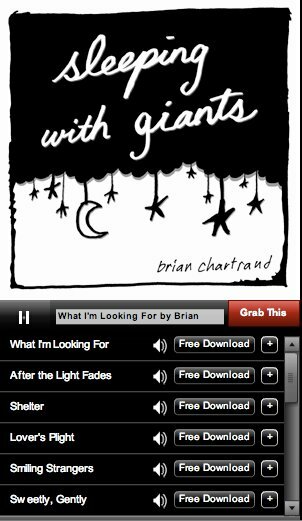 If done right, this is a win-win situation: in this case, the artist is paid, and the fans get free music – along with an ad-supported intro by the artist himself that goes something like “Brian Chartrand here, you’re listening to ‘sleeping with giants’, brought to you by Ubisoft.“. The participation of the artist in the ad itself somehow gives the whole system a more grass-roots feel, like listening to a radio presentation of the song. TrueAnthem is selective in the choice of artists it currently promotes (understandable when you have Adidas signed on for an ad-campaign), and is currently accepting applications from bands who want their widget and advertisers. We’ll need to wait and see if they favor big-name and already-signed artists, but it would not be surprising, as they need to justify the mass-appeal to their advertisers. Not surprisingly Nine Inch Nails, a band always at the forefront of innovative ways to distribute music in a grass-roots manner, has already signed on. I personally think it’s a great idea – and wonder why music labels haven’t come up with something like this already – in fact, I wouldn’t be surprised to see TrueAnthem open and licence their platform to music labels in the coming months – that’s if myspace doesn’t beat them to it. Definitely something to keep an eye on. Mruff. true that we all want to make money as artists but i am hoping that in this current world where advertising for big companies everywhere, i don’t have to associate massive corporations, sweat shop labour and multinational giants with my art… i prefer the other options on the site! stick to the little people and they will support us! I’m also curious to see where this trend goes. trueAnthem seems to be doing things the right way. WE7 is also a new player in this space worth keeping an eye on.